Professional admiration aside though, I have mixed feelings about Glossier. They use the cheapest type of packaging, and their formulations are not game-changing proportional to the price tag. Their makeup obviously had women who don't even need makeup in mind. I like my makeup to provide a lot of coverage and color, thanks! Unquestionably, their marketing machine is on another level, so owning something from Glossier is cool. Recently, a friend of mine (hi Theresa!) picked up the Glossier Cloud Paint for me while she was in New York. I was actually most curious about this because the reviews were mostly positive! The Cloud Paint is a lip and cheek color with an easily blendable creamy texture. At 30 USD for two, or 18 USD for one, the price is not too bad since each tube has 10ml of product. This is not an original concept though. Save for the different design and the colors, this is basically the Etude House Water Color Blusher re-animated. I actually had a few of those and yes, the texture and feel are the same. The packaging component is exactly the same too, which is plastic shaped like a paint tube. The Etude House blush sold for P348. Unfortunately I don't have the Water Color Blusher in my stash anymore for comparison, but I can say that the Glossier Cloud Paint is definitely more pigmented and long-wearing. I like that the shade I have, Haze, legit stains my cheeks and can last through a tennis practice. It blends nicely on top of makeup too, though I have to work faster once it's on my face. It sticks for about five hours on me. I love that the color evenly shades both my lower and upper lips. It stays on for about three hours but It will fade in the center after a meal. The color may be intensified, like how I'm wearing it, or sheered out depending on your preference. Two layers is enough to get the max pigmentation. If you have dry lips, you should wear a lip balm on top as the formula doesn't add any moisture. The Glossier Cloud Paint in Haze on bare skin. Haze is a juicy berry red shade. One thing I really, really don't like though: I always squeeze out too much! Even with a controlled squeeze, too much product good for two or even three uses comes out. Such a waste. I wish they would consider making the hole smaller, or placing a spout. Overall, I really like the Glossier Cloud Paint in Haze and have been using it mostly for super cash days. It's my go-to tennis tint, since it can survive my sweat! I think it's worth the money if you're looking for a tint that stays put. 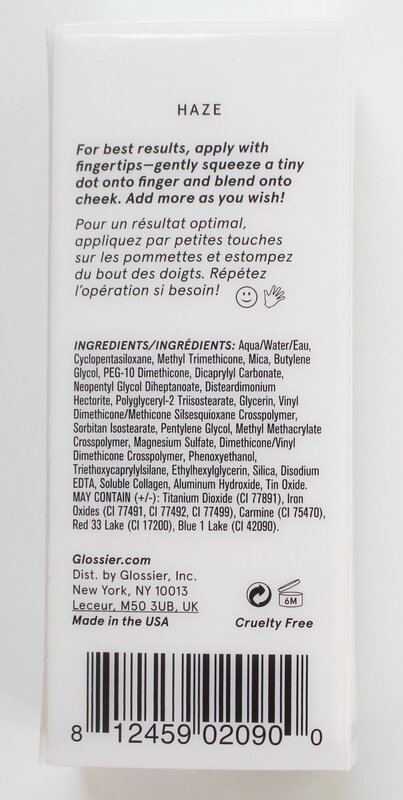 What's your fave Glossier product?